Too many business owners get trapped inside the very businesses they work so hard to build. If they don’t show up each day, or something happens to them, their businesses die. In this step-by-step business guide, you’ll get the concrete road map you need to build a business you can sell, scale, or own passively. How to escape the Self-Employment Trap. The 4 building blocks of all scalable businesses. 15 cash management secrets to guard your business’s cash flow. 12 power techniques to rapidly increase your sales. 35 business controls you’ll need to successfully scale your company. A 30-question audit to determine exactly where to focus. 6 time mastery strategies to free up a full day each week to build your business. A powerful 5-step action plan to take your business to the next level. Listen to what these successful business leaders have to say about Maui Mastermind series of books for business owners! 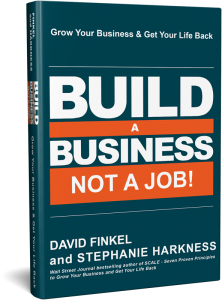 David Finkel is the Wall Street Journal and Business Week bestselling author of 45 business books and courses. His how-to business articles have been featured in over 6,500 periodicals and his weekly eletter is read by over 100,000 avid business owners around the world. A former Olympic-level athlete, he is a business multi-millionaire and founder of Maui MastermindTM (www.MauiMastermind.com). David and the other Maui Advisors have successfully started, scaled, and sold over $2 billion of businesses. Stephanie Harkness is the cofounder and CEO of Pacific Plastics and Engineering. Over the past 30 years Stephanie has launched and sat on the boards of numerous start-ups, guiding them to successful exits. She is the former chairperson of the National Association of Manufacturers.